Oliver Hannon-Dalby's return of 5-27 against Glamorgan was the best by a Warwickshire player in a one-day game for more than a decade. 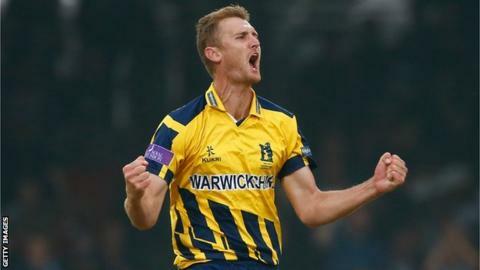 Warwickshire have put their poor start to the One-Day Cup firmly behind them and are now feeling confident about making the quarter-finals says seamer Oliver Hannon-Dalby. The fast bowler, 26, took a career best 5-27 as the Bears beat Glamorgan to claim their second straight win after back-to-back losses. "There were some things we did very poorly in those defeats," he said. "We've tried to move forward and put it to bed and we have in the last two." The Bears' nine-wicket win at Edgbaston continued their impressive turnaround in form after heavy defeats in successive games against Nottinghamshire and Essex that drew stinging criticism from director of cricket Dougie Brown. Warwickshire face cricket scheduled on 11 of the next 14 days across all three formats. Wednesday's One-Day Cup match against Hampshire is followed by a championship game against the same opponents, before their T20 Blast quarter-final against Essex and their last two One-Day Cup fixtures. "We didn't play well in those two games," Hannon-Dalby added to BBC Coventry and Warwickshire. "But we had a good training session and we put our thinking caps on and now that's hopefully forgotten and we can take some good momentum going forward in the competition." The 2014 finalists are now one of five teams on five points in Group B, two points behind leaders Nottinghamshire. With only three group matches left and second-placed Hampshire up next on Wednesday, Hannon-Dalby said he knew it was going to be a tight race to make the top four and claim a place in the knock-out stages. "I think we need to win most of our games," he added. "We could maybe get away with one more loss but, ideally, we want to be winning all of them."